We started making products with words over 12 years ago. 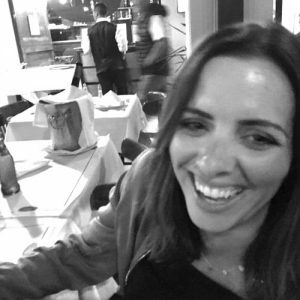 The business was founded by husband and wife team Joe Jennings and Amelia Mantero – Joe’s background in Graphic Design and Amelia’s experience in retail was the ideal combination when they were trying to find truly unique Personalised gifts for Christenings and baby gifts for friends. After getting inspiration from vintage toys and more contemporary art they came up with the ABC frame – hand pressed minature ABC blocks spelling out the child’s name with a personal engraved message. The first one was a huge hit and instantly orders started to come in from friends and family. In 2014 Joe and Amelia decided to go into business full time and have introduced more innovative products that customers can personalise for their special occasions. Most of our products contain a typographical or design element that customers can change to make it special for them. Joe is the designer and chief maker. 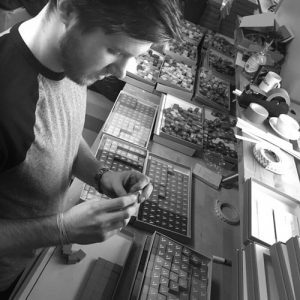 With a degree in Graphic Design, Photography & Illustration from Dublin Institute of Technology, he enjoys creating new personalised gifts with a typographical twist. He ensures every piece receives the same level of care and attention to deliver a high quality product. Amelia manages the orders and with her great eye for detail checks everything thoroughly. She makes sure everyone in the studio is doing what they should be to get your orders as quickly and as efficiently as possible. Jack ensures your product dispatches on time and is packed safe and sound. 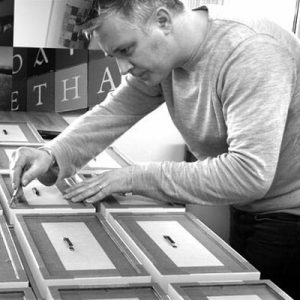 He also works on lovingly pressing our miniature blocks, mounting and framing all our personalised art prints. When not busy in our studio, he’s busy on the decks making his (sweet) electronic music.